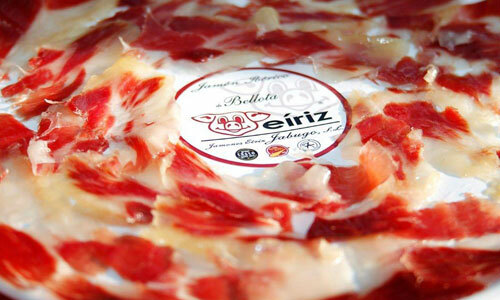 We, Jamones Eíriz organize gastronomic visits in our "Dehesa" fields and facilities, available in 4 languages, with a guided tasting of Iberian ham. 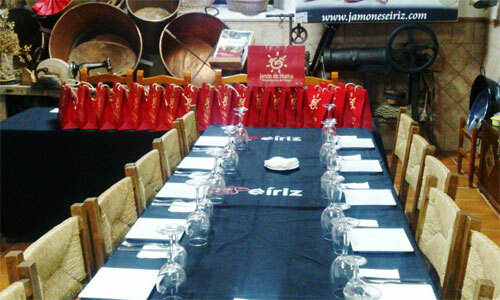 Our cellar, drying house and distinctive gasthronomic taste, are integrated into the "Ruta del Jabugo" Association. The tour lasts about two and a half hours where visitors enjoy and learn about the fascinating world of the preparation of Iberian ham. 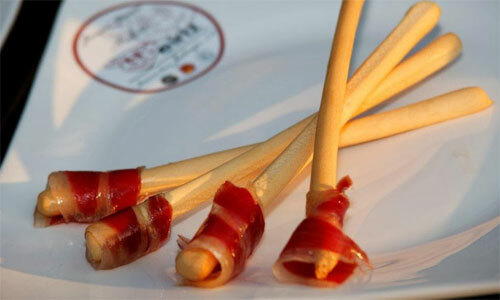 This fun and informative tour is one that you will remember in years to come, you will see how traditional and natural practices are still used in the production of the finest quality Iberian Hams. In Corteconcepcion, in the province of Huelva, you can visit our "dehesa" fileds where the Iberian pig breeding in the wild, nearby our facilities. During 40 minutes, we walk in this special habitat of cork and holm oaks which to breed these special pigs. They roam free among the trees and their main diet is the acorns from these trees. You will learn about the genetic characteristics and behaviour of the pigs in their environment, as well as the production guidelines established by the regional government to guarantee both the safety and quality of the Hams, which receive a C.O. certification. You will have ample opportunities to ask questions and discover more about these incredible animals and how they live. 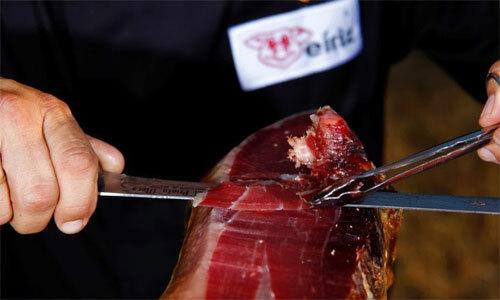 In this part of the tour you will discover how hams are prepared and the unique environment that is available in the Sierras de Aracena, to enhance the flavour of the hams. There are four stages: Salting, Post salting/salt balancing, Natural drying and finally slow Maturing. 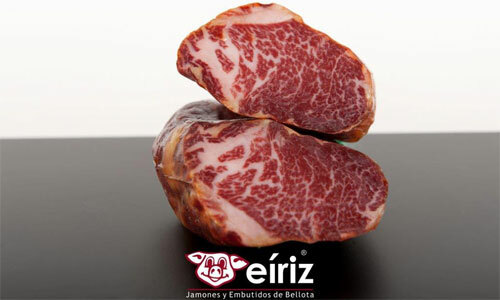 At Jamones Eíriz we use the traditional natural drying method and our experience and skill to control the temperature and humidity during the drying period. You have the time and chance to see all the processes, smell the wonderful "aromas", and once again please go ahead and ask as many questions as you like. We are more than happy to help you. And these will be accompanied by specially selected wines produced in Huelva province – a fruity, oaked wine called Vado del Quema and a dry and generous wine by the name of 1965. To finish, enjoy a rare treat, some 100% Iberian acorn fed cured pork loin or Iberican acorn fed small pork loin, paired with a sweet orange wine. The cost per adult is €42,50 (€85 per couple) and this includes VAT (taxes) and tastings. Children under 12 may enjoy the tour FREE, children under 18 enjoy 50% off. Minimum of two people to organize a guided tour. For groups of 10 or more adults apply special rates. There are two tours each day starting at 11am and 3:30pm and a reservation is essential in all cases. We recommend that you bring comfortable and suitable clothes. For example, warm clothes in winter, and bring umbrellas in the rainy season. We ask that you bring shoes that cover your whole foot in all cases. I have reduced mobility, may I join the tour? We can accommodate most types of mobility issues and if you let us have relevant information in advance we are happy to make all efforts to assist your visit. Yes you can, by all means, and this includes at all of the stages of the tour. Can I buy any of the products? At the end of the visit, you may buy Hams, sausages, cheeses and locally produced Extra Virgin olive oil etc. directly from our shop and we shall be happy to organise delivery if we are able. Depending on the time of year, production processes will be in different phases, therefore it may not be possible to see some parts of the process directly, but we can show you videos and photographs of those processes. Reservation and online payment required. Select the tour (by language), the number of people and you can pay with your credit card safely. If you have any questions about the tour or the services we provide ... please do not hesitate to contact us and we shall be happy to help.